Is Your Brand Costing You Customers? How do you start building your brand into a Kiwi Icon? We’ve put together some basic tips to help you build the foundation of a successful, enduring brand. Download your FREE copy. Are you losing sales and want to know if your Brand is letting you down? Does your Brand need an overhaul or nudge? Are you ready to focus your energy and generate sales? 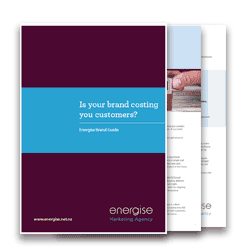 Download your copy of the “Is your brand costing you customers?” Energise Guide.